A windy cold noon on the Foreland promontory outside Lynmouth. 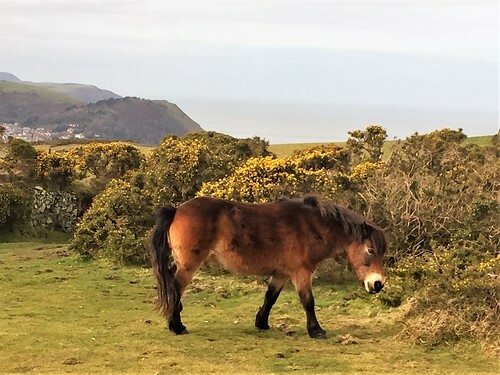 Moor ponies chewed the gorse on the slopes above Countisbury church, drawing back their lips as though seized with private laughter as they delicately snipped off the yellow flowers with their pale green teeth. We walked north along the cliff path, treading warily above steep drops where the sea creamed in lace-edged waves on black pebble beaches eight hundred feet below. A milky sky stretched over land and sea. A big blue and white freighter idled in the Bristol Channel, and fifteen miles away the dunes and low hills of the south Wales coast rose under a white surf of cloud. 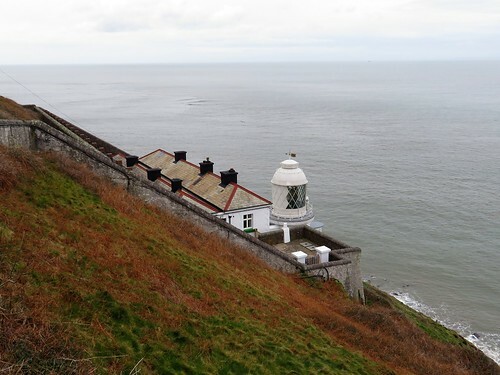 A teetering path descended over skiddy scree to Foreland lighthouse. 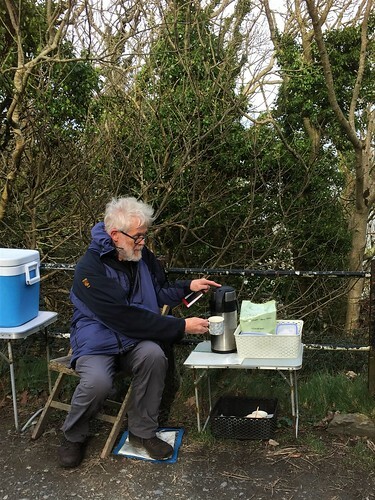 But we favoured the wider South West Coast Path and the narrow service road to the lookout eyrie above the stumpy tower, where great curved scimitar blades of shaped glass flashed a continuous message of danger to shipping. This is a wicked coast in winter, all unforgiving tides, cross currents, hidden reefs and a lack of safe havens. 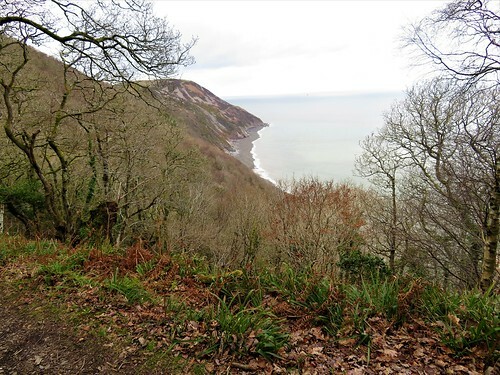 In a January storm in 1899, the lifeboatmen of Lynmouth hauled, shoved and cajoled their vessel up and over these cliffs by night. Heavy seas had rendered their home harbour inoperable; there was a ship in distress requiring their attendance. 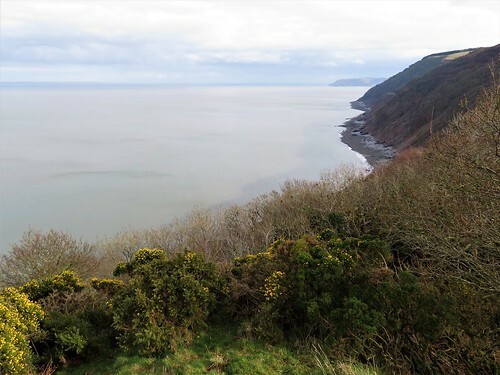 So they dragged the boat for fifteen precipitous miles to the next harbour of Porlock, and rowed to the rescue from there – an extraordinary feat. 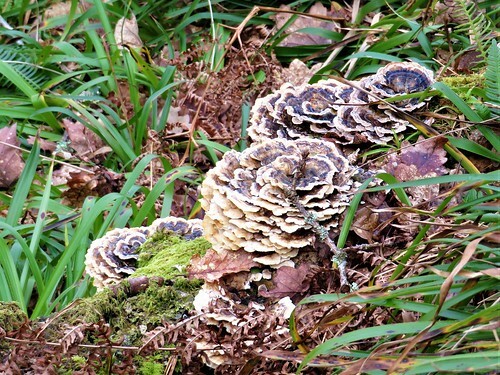 The coast path ribboned eastward through oak and birch woods, up and down along the cliffs. Glimpses forward showed the plunge of slit-thin combes to dark narrow beaches. The sense of height, space and freedom up here in the cold winter wind set my head spinning. At last we turned inland below the unseen farm called Desolate and followed the field path back past Kipscombe. 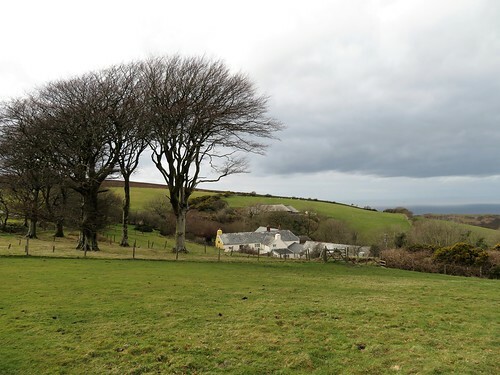 The grey and white house lay quiet below its sheltering beech trees, looking out across a wooded combe to a misty grey and white sea that lisped and murmured at the edge of sight and sound. 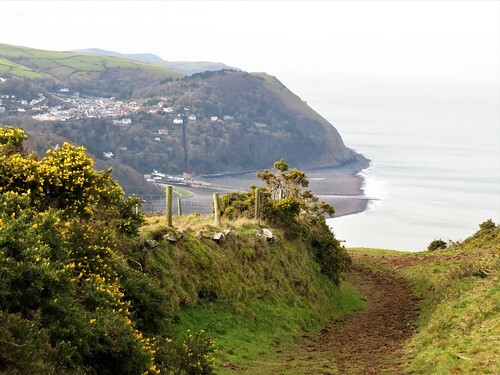 Getting there: A39 (Lynmouth-Porlock); car park is at top of Countisbury Hill, beyond Blue Ball Inn. Walk (5¾ miles, moderate, OS Explorer OL9): From car park walk seaward; left along wall; in 500m, right on Coast Path/CP beyond bench (747499). 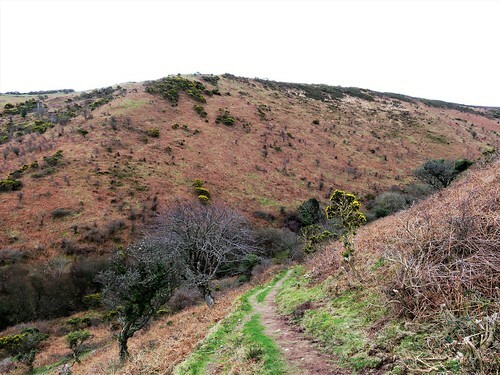 In 600m bear left downhill at 3-finger post; right at 2-finger post below (‘Porlock’), descending to road (756505). Left to lighthouse viewpoint (754511); return up road. At sharp right bend (758503) keep ahead on CP. In 200m CP zigzags right (759503, YA). In 1 mile CP rises up steps; at top, right off CP (775498, ‘Countisbury 2’). At top of rise, right at 2-finger post (770498); in 50m, left (YA) up path to Desolate farm drive. Right to gate (770496); right (‘Countisbury 1¾’) across fields (fingerposts, YAs) past Kipscombe Farm, back to car park. 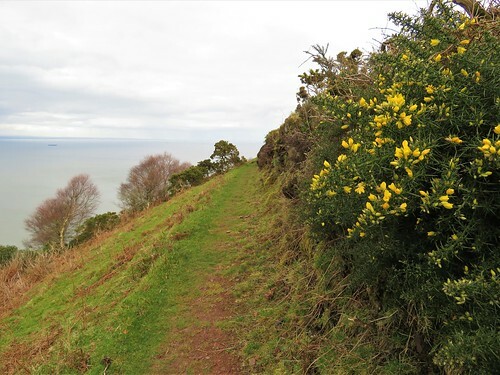 Conditions: Careful on coast path – unguarded edges, steep slopes. 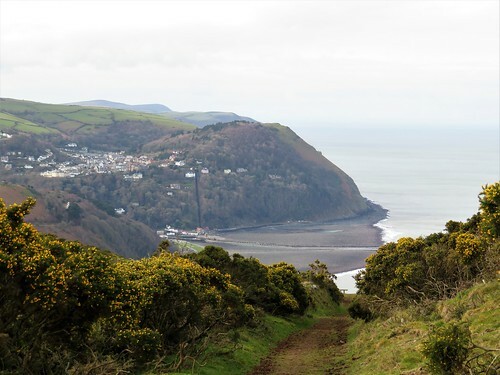 Accommodation: Rising Sun Inn, Lynmouth EX35 6EG (01598-753223, risingsunlynmouth.co.uk) – comfortable, cheerful, full of character, wonderful food. Stanfords Bristol for a wonderful launch of #ShipsofHeaven Friday night! Packed house, really good atmosphere. Later, over the road at Slug &..
Kingston & Kimmeridge, Dorset christophersomerville.co.uk	A brisk windy day across the Isle of Purbeck. From high-perched Kingston we looked north across the valley to a gap in the long ridge of the Purbeck Hills, neatly plugged by the ruins of Corfe Castle.